Renovation is messy. And part of us wants to just hide all the mess, but we feel it is far more important to be transparent about what we are working on. At Wildflower, we built our business around the idea that we will always push ourselves to find a more compassionate approach. And that has led to some pretty significant changes over the past few weeks. In short, we have doubled down on our commitment to our human clients. They are at the centre of everything we do, but re-iterating this commitment gave us a more focused lens with which we look at the world and our business. And a few things surfaced that made us realize we had to change things up. Our survey system, an innovation we are quite proud of, suddenly came into question. As many of our clients know, we check in on a pre-defined schedule with a few key questions to understand the impact and effectiveness of our programs and how things are proceeding from their perspective. But we now realize there were a couple fundamental flaws: the system recorded responses in a way that we could only review if we logged in to check on them. This led to some clients leaving us with requests for assistance that we weren't seeing for days, or worse, for more than a week. 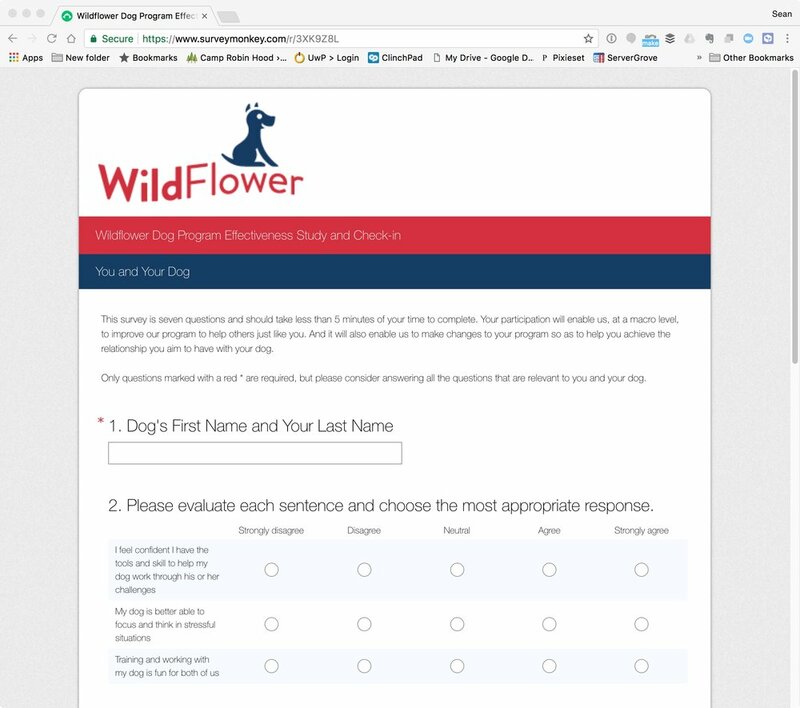 The questions were also biased; they were designed around fixing a problem and as a result focused almost entirely on the dog, not the human. So we are in the midst of completely overhauling our survey system and the long-term study at the foundation of it. The new system notifies us immediately with the individual survey results while also integrating those results into our Customer Relationship Management system. So now, all of our staff can see the goals and program notes, past emails and, starting today, the ability to see the survey results and any corresponding concerns that have been raised. The new survey you will be seeing. In addition, we have completely overhauled our Behaviour Modification packages. The new program includes more follow-up sessions but also has a more streamlined sign-up process and is now built entirely around the relationship goals of our human clients. We found ourselves spending too much time lecturing and focusing on how to fix a behavioural problem and not enough answering the question, "What does a good day look like for you and your dog?" Our clients come to us because they adore their dog and want to have a positive and rewarding relationship together. And while our tools were effective at changing the dog's behaviour, by focusing on the problem and not the desired relationship outcome, we saw that we were too easily failing our client's expectations. This change to the program has also led to an overhaul of the materials we use and even how we behave in our in-home sessions. It's too early to report on what the results of all this are, but we can say that the feedback from clients experiencing the new program has been overwhelming. And that feels amazing. We owe a lot of this to a conversation on the frames with which we see the world led by Alexanda Kurland at the Training Thoughtfully conference in Milwaukee. She urged us to explore our frame of reference and to learn how to build a shared frame with those we work and interact with in the world. Our shared frame lies in the relationship our clients yearn for with their canine friends. Their dog's fear, anxiety and subsequent aggression impacts this relationship, not to mention the safety and emotional well-being of everyone interacting with the dog. The answer is not to lecture Mom and Dad. They are already at their wits end. They are scared, frustrated and/or concerned. They are looking for an ally and someone who can meet them where they are. And that is why we created Wildflower Dog, to be that ally.